In a story last week by TDN reporter Marissa Luck, we learned the Cowlitz PUD plans to increase rates by 2.5 percent. We spent more than an hour talking with Cowlitz PUD executive management last week in an effort to understand the situation. If you regularly read the editorial page, you know we dislike taxes, fees and rate hikes. However, in this case, the editorial board supports the 2.5 percent Cowlitz PUD Approves 2.5% Rate Hike because the PUD seems to be making the best of a bad situation while minimizing the impact to households and businesses as much as prudently possible. The rate increase shouldn't be called the Cowlitz Cowlitz PUD Approves 2.5% Rate Hike, it should be called the Bonneville Power Administration rate increase. BPA is raising rates by 5.4 percent, and Cowlitz PUD is contractually bound to purchase power from BPA. The Cowlitz PUD power contract with Bonneville goes through the year 2028. As Luck reported in the story published last week, Cowlitz PUD gets about 90 percent of its electricity from Bonneville, and power constitutes by far the largest percentage of the PUD's overall budget. With power costs on the rise, the PUD has fundamental business decisions to make. They could pass along 100 percent of the BPA rate increase to customers or pass on some portion. The PUD could choose to pay for 100 percent of increased expenses with existing cash reserves and not pass any rate increase along to customers. Or, the PUD could do a combination of both a small rate increase and use cash reserves -- which is what they chose. We agree with the PUD strategy because the power business is a little like gambling -- if you bet too aggressively, you can lose your shirt. The strategy the PUD has chosen will mean a small increase in cost to households now, but should avoid large future increases. Each year the PUD has to make an assumption on the type of "water year" for the coming 12 months. A good water year is like last year where a heavy snowpack and never-ending spring rains resulted in a consistently high level of power generation. In a good water year, the PUD can generate excess power and sell it on the market to generate extra cash. This extra cash can be used to create cash reserves, pay down debt or whatever. Conversely, a bad water year would be 12 months of little to no snowpack, little to no rain and no wind. That type of year means the PUD may have to source additional power at higher prices, which could easily result in financial losses and a big hit to cash reserves. 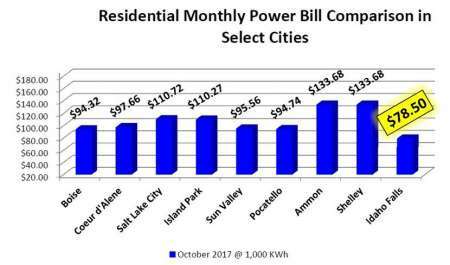 If PUD executives plan for an average to good weather year and it is bad weather year, customers will end up paying higher rates over the long term as PUD expenses go up. At the same time, if the PUD always assumes it will be a bad weather year, it may not be willing to use cash reserves to help cushion the blow of rate increases passed along by the BPA. What is the point of having cash reserves if you don't use them to benefit your customers? What the PUD is doing with the 2.5 percent rate increase is substantially cushioning the blow to the ratepayers by using reserve cash, but still increasing rates a small amount to ensure the $9 million or more of the cash reserves is not drained should a bad weather year occur. The net effect of this strategy is to keep PUD cash reserves at a high enough level to support ratepayers should two or more bad weather years occur in a row. And, it keeps the rates Cowlitz PUD charges households competitive with what other similar PUDs are charging. While nobody likes to pay more for anything, the PUD's strategy is sound, and provides the best outcome out of a BPA rate increase.